Anchorage Community Theatre is presenting a zany comedy for the holidays from the pen of Atlanta playwright Topher Payne in Let Nothing You Dismay. 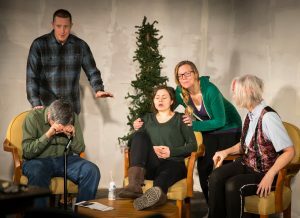 Twenty-two characters played by eight actors tell the story of a young couple waiting for the birth of their soon-to-be-adopted child on Christmas Day. Joining Host Steve Hunt this week on Stage Talk is Missy Overly, an actor who plays three different parts, and David Block who has taken on the reins of Director. Let Nothing You Dismay runs November 24 through December 17 at Anchorage Community Theatre located at 1133 E. 70th Avenue. ORIGINAL BROADCAST: Friday, November 24 at 2:45 p.m.